The Abel Nipper Lanyard is as much like those old camp lanyards as a VW is to a Hummer. Or an old Kodak box camera is to a new Nikon. The AbeLanyard is strong, lightweight, really neat looking and a terrific addition to an angler’s arsenal. 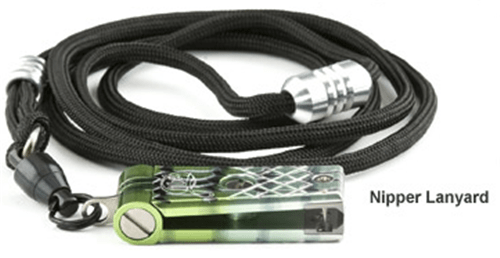 The lanyard cord is paracord, a lightweight Nylon™ rope originally used in the suspension lines of parachutes. It is now used as a general purpose utility cord by both military personnel and civilians including various space missions. Bottom line: It will not break! Unlike twisted or woven lanyard cords, the AbeLanyard Cord is highly supple, virtually unbreakable and a joy to wear in every fishing condition. With an AbeLanyard, your Abel Nipper will be right where you need it – at your fingertips.